John Walda (right), with Randy Gentzler, NACUBO board chair 2016–17 and vice president for finance and administration, Loyola University Maryland, during the NACUBO 2017 Annual Meeting. 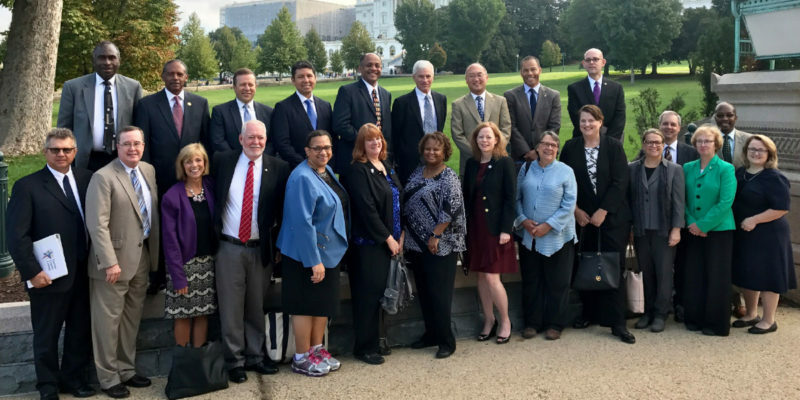 In my short time as NACUBO’s 2017–18 board chair, the organization has been busy focusing on the new strategic blueprint, meeting with constituent councils, visiting lawmakers on the Hill, touting the value of higher education, and welcoming a new cohort of NACUBO Fellows to the second year of the program. It has been a pleasure and privilege to be part of these efforts. As we move forward, we face a new challenge. John Walda has decided to retire from his position as president and CEO of NACUBO at the end of his contract term, which is July 31, 2018. After 12 wonderful years of John’s leadership, the board of directors respects his decision and is determined to take full advantage of the time we have left with John at the helm. 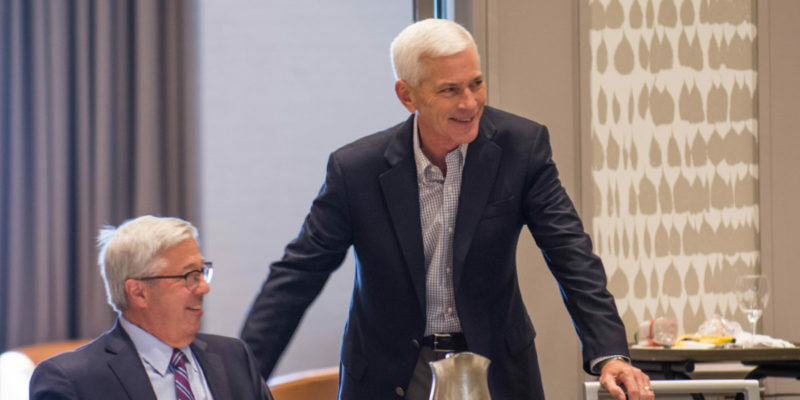 Together, we plan to step up our efforts to produce impactful programming and engage in proactive advocacy, both of which have been hallmarks of John’s tenure at NACUBO. A search has been launched to identify NACUBO’s next president and CEO. The board has chosen the executive search firm, Korn Ferry, to lead the efforts in that regard. Please join us as we take full advantage in the coming months of John’s exceptional talents and work to identify our next leader. NACUBO CONTACT Mary Lou Merkt, NACUBO 2017–18 board chair; and vice president for finance and administration, Furman University, Greenville, S.C. Distance learning webcasts and live streaming programs continue to be available after their original air dates for NACUBO members. Current on-demand sessions include topics related to legislation, tax reform, technology, tuition discounting, and many others. Most recently, in September, NACUBO hosted its fourth, free, 30-minute legislative overview, with NACUBO’s federal affairs team discussing the latest higher education news from Washington. More than 400 attendees tuned in to the webcast, titled Legislative Lunchcast: A Washington Update, to hear about federal actions with the potential to impact campuses, as well as notes from the panel about advocacy, financial responsibility, and communicating the value of higher education. The panel, which included NACUBO’s Liz Clark, director of federal affairs; Megan Schneider, assistant director of federal affairs; and Bryan Dickson, senior policy analyst, discussed potential budgetary, tax, and regulatory changes, and the wide-ranging implications for students and institutions. Panelists also provided updates on the Perkins Loan, student aid, DACA students, overtime, 1098-T, facilities and administration, and Cybersecurity Awareness Month, which was observed in October. The next federal affairs update is scheduled for later this month. Visit the Distance Learning page at www.nacubo.org for updates. NACUBO President and CEO John Walda (back row, sixth from left); NACUBO Board Chair Mary Lou Merkt (first row, third from left); members of the NACUBO board; and members representing the four constituent councils attend NACUBO’s seventh annual Advocacy Day on the Hill. Approximately 40 members from NACUBO’s four constituent councils, representing chief business officers from community colleges, comprehensive and doctoral institutions, research universities, and small institutions, convened in September in Washington, D.C.
Their meetings included presentations by NACUBO staff about new initiatives underway related to NACUBO’s strategic blueprint, including efforts to assist institutions in communicating the value of higher education. During this session, staff described the new toolkit, resources, and infographics that NACUBO has developed to guide business officers when they are advocating for the individual, institutional, and societal benefits of a college education. Participants also identified current challenges and opportunities, and visited Capitol Hill for NACUBO’s seventh annual Advocacy Day. This year’s event brought 24 NACUBO members to nearly 50 congressional offices during their daylong visit to the Hill. During the visit, NACUBO hosted a congressional briefing, where congressional staff learned about the potential impact of changes to charitable giving under tax reform, repercussions on enrollment and graduation rates by limiting federal student financial aid, and other issues important to colleges and universities. Speakers included CBO panelists Karl Brockenbrough, vice president of administration and finance, Bowie State University; Choi Halladay, vice president of administrative services, Pierce College District, Washington; Kelly Fox, senior vice chancellor and chief financial officer, University of Colorado Boulder; and Stephen Schafer, vice president for finance and operations, Sarah Lawrence College, New York. The constituent councils, which assist with developing NACUBO programs, products, and services for business officers at similar types of institutions, continue to advise NACUBO and work together throughout the year. To learn more about the value of higher education resources and other strategic blueprint initiatives, visit www.nacubo.org. Although the NACUBO 2017 Annual Meeting is behind us, several of the learning sessions were recorded and will be available on-demand until Feb. 1, 2018. Participants who attended the meeting in Minneapolis and those who joined the online event will have access at no additional cost. Four recordings focused on the needs of small to midsize institutions. Thirteen recordings ideal for larger institutions, with multiple staff in the business office. In addition, the 2017 Planning and Budgeting Forum offered 19 learning opportunities, in which experienced business officers and strategists addressed the latest techniques in higher education resource management. If you’d like to revisit what you learned during this workshop, or if you were unable to attend the in-person event, six of the presentations were recorded and are available on-demand. Visit the Distance Learning page for more information, to learn about other session offerings, and to register.